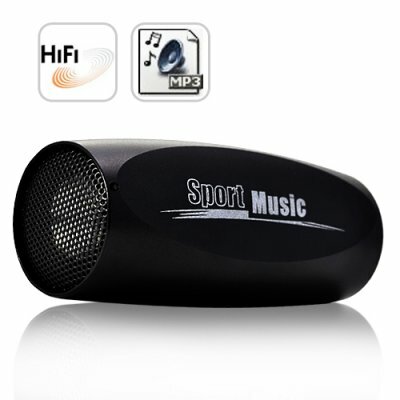 Successfully Added HiFi Mini Loudspeaker MP3 Player (3.5mm IN/OUT, Micro SD) to your Shopping Cart. Shockingly loud, detailed and rich sound from a loudspeaker that fits in the palm of your hand! We’ll just get right out there and say it- the L14 is simply BADASS! This potent little speaker cranks up to an impressive 90db (about as loud as a smoke alarm) while maintaining rich, distortion-free audio at 385Kbps. Play music directly from a micro SD card (2GB FREE) or use the 3.5mm IN/OUT jack to play music from your cellphone, notebook or other audio devices. The built-in 1450mAh rechargeable battery provides up to 15 hours of use at moderate volume and 7 hours at full blast. When using headphones the battery last an impressive 60 hours! At the end of the day simply charge it using any USB port and in 7 hours you’ll have full power again. The L14 comes with a sturdy handle-bar mount for bicycles, Velcro arm strap for running or hiking and a lanyard for quickly hanging on a tree branch, nail or other locations. If you enjoy camping, hiking, jogging, beach parties or any outdoor event, then bring the L14 along for a guaranteed good time. If you are not completely satisfied with the L14’s combination of excellent sound quality, long lasting battery, durable aluminum construction and factory direct price- then simply send it back and we’ll give you a full refund. At this price there is no reason why you shouldn’t experience one for yourself. Order now while supplies last and we’ll ship your order out within 24 hours. Is this sports mp3 player waterproof? No, this mp3 player is weather proof, meaning it will withstand, heavy winds, sprinkle rain, dust. (Note: This Mp3 player also comes with a case holder, which can protect it from the elements and help prolong its life).